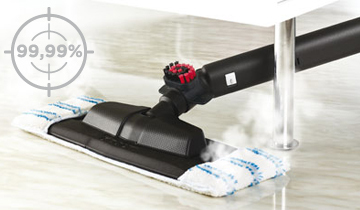 Vaporetto Pro 95_Turbo Flexi is a steam cleaner with continuous refill and Eco function. Thanks to the unlimited working autonomy and the Turbo Steam function, this appliance is ideal both for special cleaning (barbecues, blinds, car rims, tile grouting) and for daily cleaning. The Eco function is automatically set on switch on, to limit energy and water consumption. 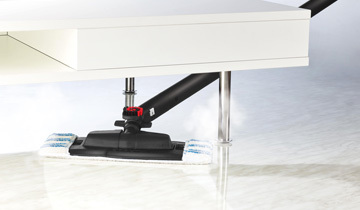 The exclusive Vaporflexi brush makes this steam cleaner more effective and manageable on any kind of floor. When using this special function the steam dispensed is even more powerful and can eliminate even the most stubborn dirt. Vaporetto Pro 95_Turbo Flexi saves 25% energy and 30% water compared to previous models**. Tests performed by an independent laboratory confirm that Vaporetto products can eliminate up to 99.99% of bacteria, fungi and mould. For deep down clean results. Vaporetto Pro 95_Tubro Flexi is even more effective when removing dirt with the exclusive Vaporflexi brush that combines flexibility and convenience for exceptional results. The easy application and removal of the cloth make the Vaporflexi brush extremely convenient: no more need to bend and to use hands, just put the ends of the brush into the pouches of the cloth and it's ready. The exclusive Vaporflexi brush with microfibre cloth is designed to clean any surface effectively; The accessory frame lets it glide smoothly even on carpets and rugs, deeply refreshing fibres.
" Vaporetto Pro 95_Turbo Flexi is a complete appliance ideal both for daily hygienic cleaning and for special deep cleaning that usually takes place only a few times during the year. " Approved by the British Allergy Foundation for effective elimination of dust mites. Even when dirt is so encrusted that it seems it will never go away, the power of steam will get rid of it. 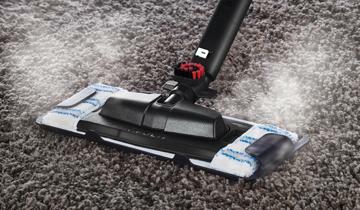 In fact the combined action of steam and bristles will remove even the most stubborn stains. *Tests carried out by an external, independent laboratory show that Polti Vaporetto kills and removes 99.99% of the most common germs, bacteria and viruses. **% less consumption compared to the previous model (Forever Exclusive). 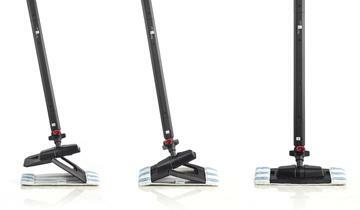 Thin and flexible brush to clean floors, carpets, and all large surfaces. Can be used with the included cloth attached. Cleans both hard and delicate flooring. Applied to the brush with the cloth, the carpet/rug accessory frame is ideal for refreshing soft furnishings easily and quickly. The small brush is ideal for cleaning resistant surfaces that have been encrusted by dirt or grease for a long time. The window-cleaning brush, complete with both soft and rubber inserts, offers sparkling windows with no streaks that stay cleaner longer. Save money, as detergents are no longer needed. This brush is designed for cleaning smaller surfaces. It can be used with the sockette provided. It is recommended for: upholstery fabrics, velvet and leather (without contact), car interiors, windscreens, small glass surfaces, tiles, cupboard doors, doors and other small surfaces. The steam concentrator can be used, with or without its round small nylon brush, to clean bathrooms, bathroom fixtures, hob burners and the refrigerator. Above all, it is perfect for cleaning tile grouting. 3 small coloured brushes with nylon bristles. 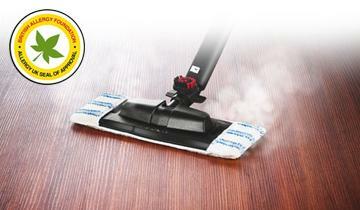 They combine the abrasive power of bristles with the effectiveness of steam, to eliminate even the most stubborn dirt. Choose a colour for each type of surface or a given room to ensure the utmost hygiene. To be used with the steam concentrator in hard to reach places. 2 microfibre cloths are provided for attaching to the brush to collect the dirt dissolved by the steam. For all types of flooring. 2 sockettes are provided to collect the dirt that is dissolved during steam cleaning. Use with the small brush. 2 vials of Kalstop are provided, a special anti-limescale compound for products with a boiler. Made from plants, it is safe for humans, easily biodegradable and harmless to the environment. Used regularly it prevents the formation of limescale and improves steam delivery, keeping your appliance working perfectly for longer. - 25% / -30% less consumption compared to the previous model (Forever Exclusive).